I like experimenting with different setups, especially for wide angle close-ups. Last year, I took my wife's Sony A7 for a couple of field trips and paired it with the Voigtländer Super Wide-Heliar 15mm f/4.5 with extension tubes for some wide angle macro photography, and the results were pretty cool! Compared to my usual DSLR setup, the lens was much smaller, allowing me to approach subjects from more compelling angles. 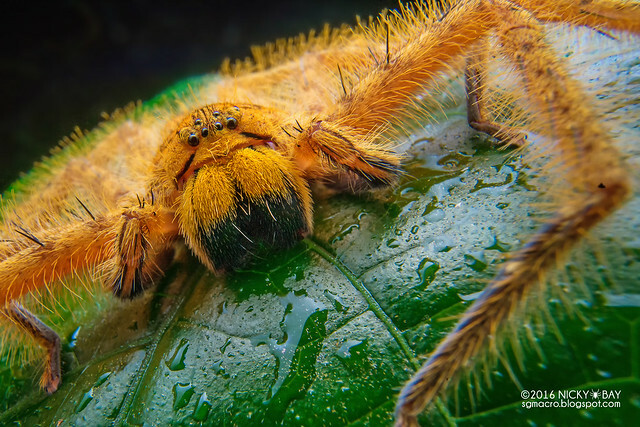 Many who prefer using long lenses for macro photography -- allowing them to put some distance away from their subjects -- couldn't fathom why anyone would want to use a wide angle lens for their macro endeavors as it results in messy background effects. 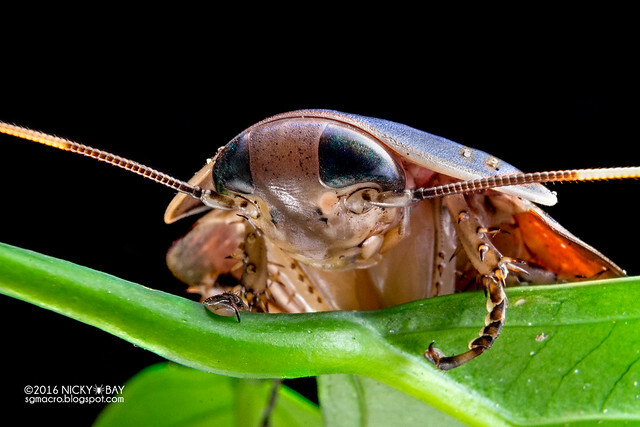 Although extremely challenging, wide angle macro photography can be highly gratifying when done right. Here are just some of the advantages. Due to the distance between the lens and sensor, the Sony E-mount was able to use M-mount lenses (with adapter) which are traditionally small. At the same time, adding extension tubes had less effect on the focusing distance as compared to similar focal lengths of DSLR systems. That is why I still had a comfortable working distance even with 14mm of extension on a 15mm lens. 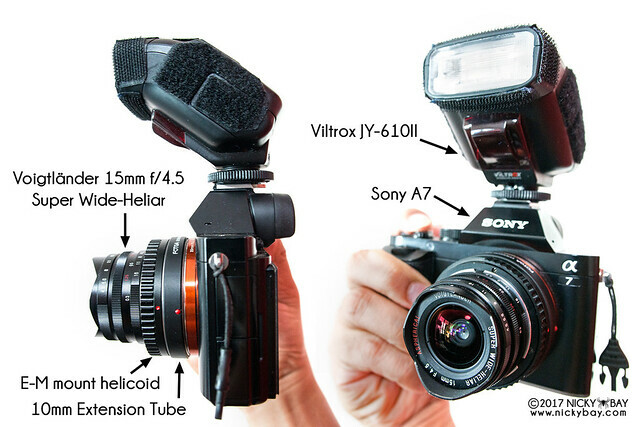 It would have been unusable on DSLRs with just a 12mm extension on a 20mm lens for example. This lens is not particularly sharp. In fact, it is terrible on Sony A7 as a normal wide angle lens with vignetting and a reported pink tint. But all these didn't matter for close ups and I chose this lens for several reasons. 15mm on full frame is wide enough! The setup is very simple, with a single cheap manual flash mounted on top. I also added my usual concave diffuser with reflector at the tip of the lens, shown below. This shot shows the diffuser and reflectors that I used, giving a better idea of how I took some of the photos in this series. Refer to photo #13 below to see the result of this shot! When lighting was insufficient, I added more optically triggered flashes at the side. 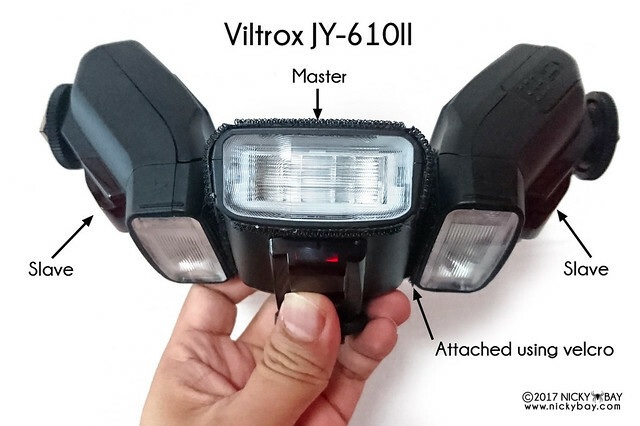 The Viltrox JY-610 II is cheap and convenient to use for off-camera lighting. 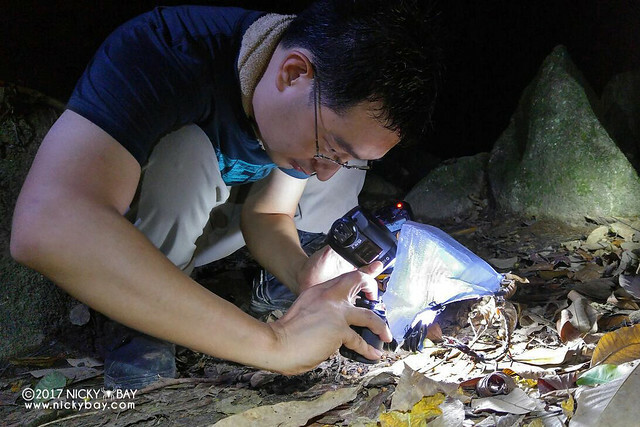 My very first attempt was on the most common scorpion in Singapore. It was an ideal subject as it would stay still even if I went as close as 1cm. 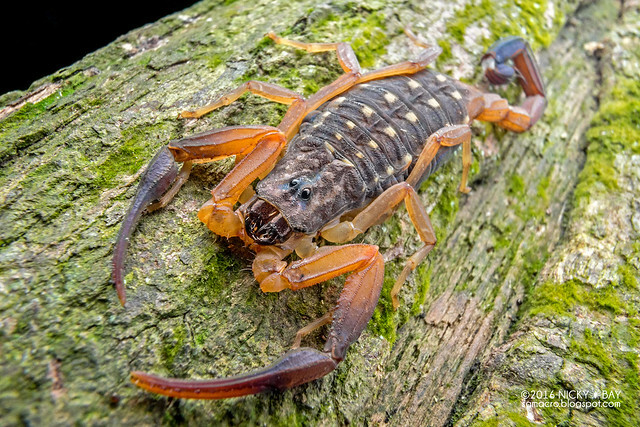 Even from this angle, most of the scorpion appears to be in focus. With this setup, it was easy to make a little cockroach appear HUGE! 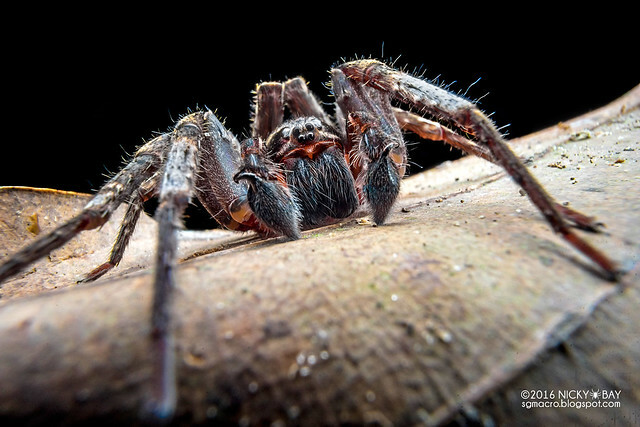 Another very docile spider from the leaf litter. This spider's forelegs were almost touching the lens, giving the impression that they were extraordinarily long. 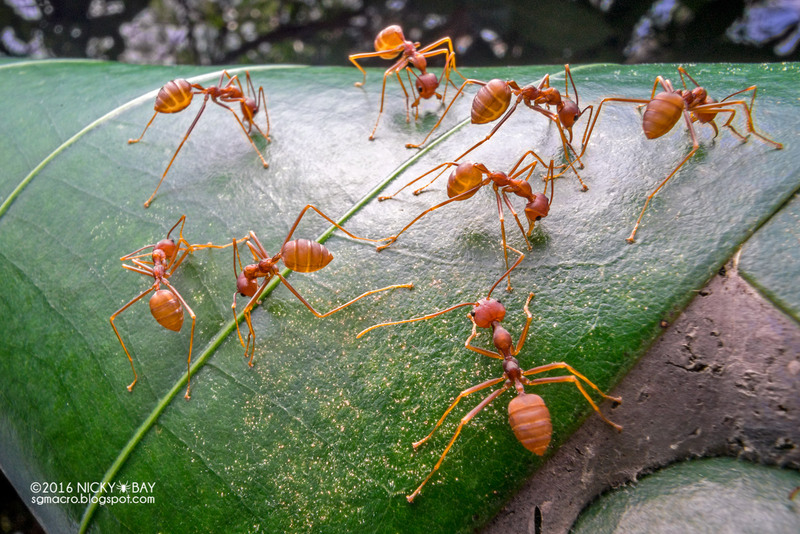 Some red weaver ants tending to their rolled leaf nest. Almost all of the ants seem to be in focus in this single shot. 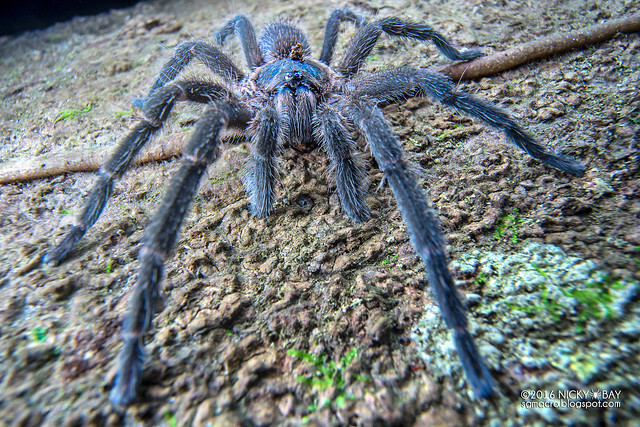 A very interesting blue-tint tarantula (not Singapore Blue) found on a tree trunk. The flip screen helped a lot in this shot. These huntsman spiders are so tame, that I could nudge them with the lens and it still wouldn't budge! 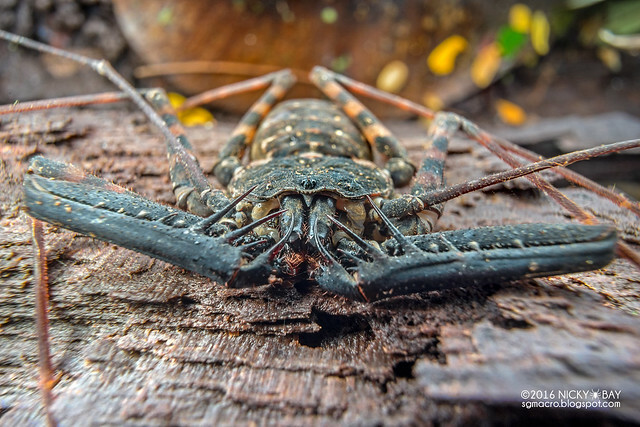 A beautiful amblypygid found at a perfect angle to get this shot. 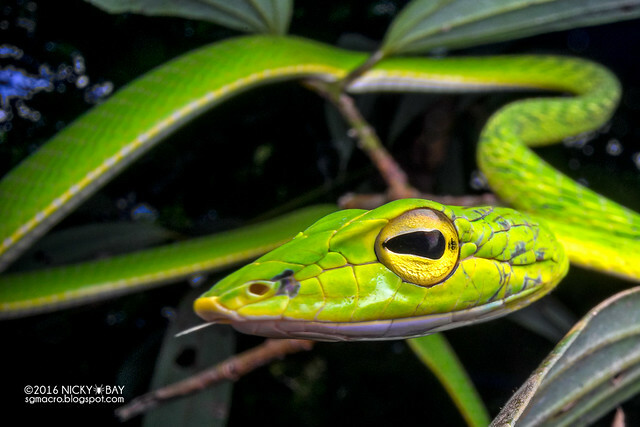 I like taking wide angle close up of snakes as well. It makes the head huge, while keeping most of the body in the frame. 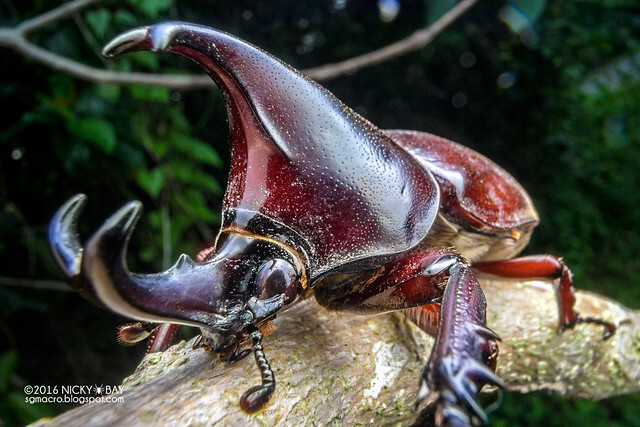 For this shot, the beetle's horns were touching the lens at times. It made the horns appear much bigger. This is a classic example of capturing a subject with the environment in the frame. I removed the 10mm extension tube for this shot, relying only on the helicoid's extension of about 4mm. One of the advantages of wide angle close ups is the ridiculously short working distance. Most see it as a disadvantage, but at such distances, the lighting encapsulates the subject very well and is ideal for reflective subjects. 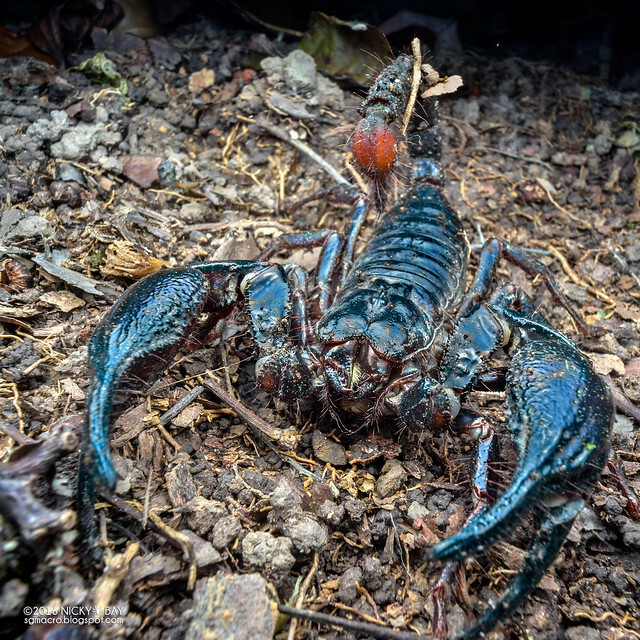 It was able to bring out the blue tint in the scorpion very well. One problem with a short working distance is that the flash may not be able to cover certain angles well enough. In this case, the light below was insufficient and I had to add an extra optically triggered flash from the side. 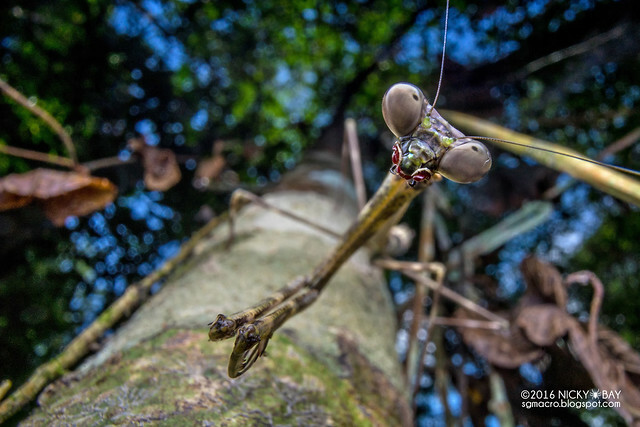 It was easy to point the camera up toward the sky with the flip screen to get the canopy as the background for this twig mantis. 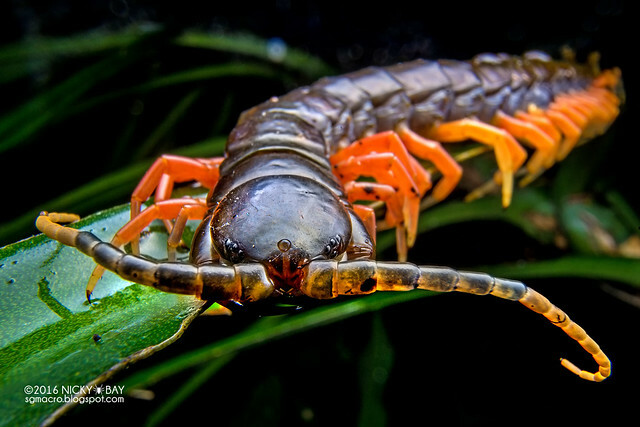 Not an easy shot as this centipede would run really fast if I accidentally touched it. As awesome as this setup might sound, I am no longer using it. The camera is currently back with my wife to photograph our kid. It was also really a chore to lug 2 full frame camera systems around in the field. 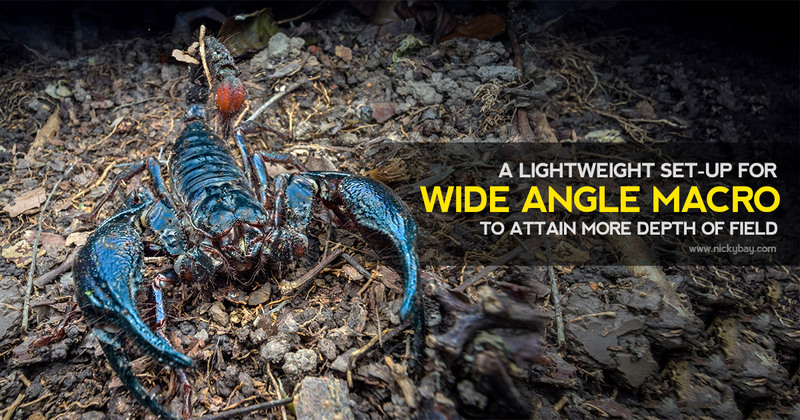 Despite that, this is a relatively simple setup for wide angle macro photography and definitely worth a try if you are interested in achieving such wide angle effects. 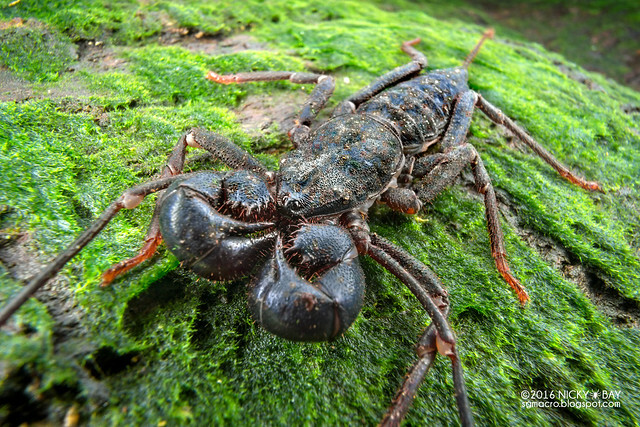 There are many other options for wide angle macro photography. I had reviewed the Laowa 15mm back in 2015, which was the world's first 1:1 wide angle macro lens. In my next post, I will elaborate on my current wide angle setup. 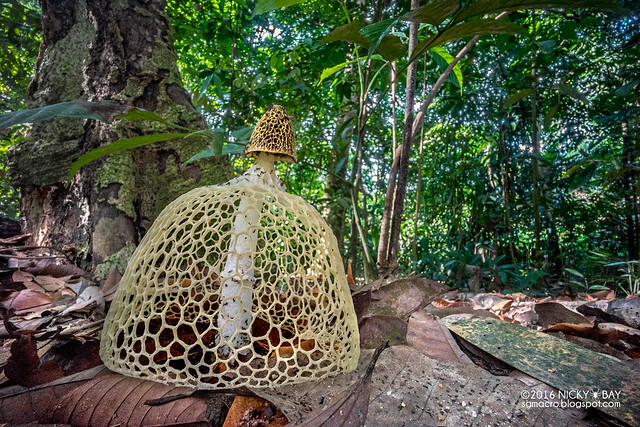 It is bizarre and attracts stares from others, even from fellow macro photographers. The results? Spectacular! Subscribe to the mailing list to be notified when it is posted! If you like my style of macro photography, consider joining the next macro photography workshop in Borneo Bootcamp 2017 and I'll promise you an unforgettable adventure in the heart of Borneo with LOTS of bugs and spiders.